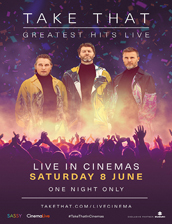 Synopsis: Celebrating 30 incredible years, Take That are bringing their huge 2019 Greatest Hits tour to cinemas for one night only! Broadcast LIVE on Saturday 8 June, you’ll have front row seats as Gary, Mark and Howard perform their biggest hits from the last three decades. Get ready to throw your hands in the air – this is one party you’ll never forget!